He was a brilliant man! Now, imagine a raindrop on a windshield of your car. It always starts to slide down slowly. Then, as it gains more water it speeds up by itself. You can almost always predict its direction as it moves. The same is with writing your own blog or general website content. If you want to write your content in a manner described above, you have to have in mind a few basic strategies. I’ll show you step by step how I write a couple of thousands of words in five or six hours spread over two days. Let’s start with a few ground rules for content architecture. First and foremost, your content should always aim at good user experience, it must be high quality and well-researched material, and you have to be helpful and useful in providing solutions to people problems. Doing a good prep work is halfway job done! Second, you have to know how to architect your content correctly. Architecture or structure of your post is a crucial aspect of getting things done fast. When you do it right, your text will be easy to read and easy to scan if your visitors don’t have time to read in full. Moreover, when you have done everything correctly, you will cut the time spent in writing by half, if not even more! How to Be a Slow But Fast Writer? It took me days to finish my material back in the times when I was starting. Today, by following all that I am going to pass on to you, I can create a couple of thousands of words in a matter of hours. This skill moved my blogging career on a whole different level. I have learned that everyone can be a pro writer. Within this post, I will teach you how to become one. Lucky for you, and me, I am blessed with an opportunity to learn from the experts in the filed. The things, trick, methods, and tactics that I have learned at Wealthy Affiliate have changed my writing forever and for the better. It is my duty, as one blogger to another, to show you everything I know. Please study this post carefully. Moreover, use it as an example of everything that I will teach you because I have used everything I know to create this lesson for you. Follow these proven methods and in no time, you will write your content like a pro! High-quality and fast writing will get you close to the top. After this lesson, you will be able to create a couple of thousand words in a flash. However, it all starts with the basics, so let’s begin. I like to cook, you see. It is a cool skill to learn. I remember how my beginning was, to put it nicely, messy as hell! Things were flying all over the place! However, after some time spent in practice, I have come up to the conclusion that proper preparation and systematic planning makes things much more manageable. It makes the work part of being done by itself. Those of you who can cook, you know what I mean. The same thing is with any other skill. Writing can be intimidating for most fo us. But if you lay a solid foundation, your house will stay there for years to come. Every blog post starts with a question. Before you begin writing, you will have to find out a few pieces of information which will heat the things. Therefore, when the time comes, the words will flow naturally. It all starts with asking yourself what the topic you want to write about and who your audience is. When I prepare for a new piece of content, I try to think of what might be the burning problem for my readers right now. Once I know the potential topic for a blog post, I go a step further and try to imagine a person who is having this problem. This way, I can mentally reach more details about my readers such as who they are, what they do, and more. It is an essential part, so make sure you will do it every time before you begin with the actual writing of your content. To give you an example straight away and to clear the confusion. Your problem is writing your content fast. You want to know how to master this skill. You are probably a new blogger who is trying to figure out things as quickly as possible. Moreover, you are eager to learn and also to do your work. This short analysis gives me a person to talk to (I will explain this more by the end of the post). Now, I know who you are, and I know what might be bugging you. The next thing I do is Google research. You see, I have the knowledge to fix your problem, but, it might be incomplete. That is why I ‘google’ a few terms related to the topic and go a step further to see what can I add to my treasury before I pass it on to you. Once I am all warmed up, I have researched the topic, and I have a person who needs my help, the next steps follows this one naturally, so let’s move on. At this point, you should have come ‘shadows’ of topics for your post. The next task is to conduct keyword research to give it a more concrete shape. Before you start to compete for specific terms and topics, the wise move is to create a couple of variations of keywords to see which one will get the potential power and help you rank high in Google. The best and easiest way to do keyword research is by using one of the tools which allow you to get more details about your potential topic. One thing I do before I do keyword research is to check out what Google might be suggesting to you. You see, there is no final keyword for a particular topic. Therefore, you will have to listen to the voice of the people before you decide on a theme. This short research gave me an insight on what should I look for when creating my keyword. It is a great way to get your thoughts flowing before your mind yields some ideas. Once you feel right about a particular topic, now you have to see is it ‘available’ to say it like that. As I have said already, I use help from a keyword research tool. My favorite tool for doing so is Jaaxy. I found it to be brilliant for many reasons. Jaaxy is a keyword tool which enables you to get insights into the mind of Google’s users. To be a successful online content writer, you will have to know what your readers think, what is their problem, and how can you help them. Jaaxy is free to use within Wealthy Affiliate platform! All you have to do is enter your keyword variation and read the metrics. Jaaxy tells you is the topic worthy of your trouble or should you leave it alone. Therefore, it helps you to save time and energy by choosing the right variations. This tool tells you how many people are searching Google for that particular topic. Furthermore, it shows you how much traffic can you expect if you rank high for it. The last metric is the one you should put the most attention. You see, Jaaxy tells you how many websites are already competing for the exact topic. It shows you should you follow through with your idea or should you leave it alone and try something else. Moreover, this tool shows you numerous possible keyword variations which might work also! It brainstorms tens of similar topics, so you don’t have to. Even if you find out that hundreds of writers already take the keyword you are looking for, you can always pick something similar in the domain and get your piece of the traffic pie. At this point, you should have a clear picture of your topic as well as selected keywords that will help you rank. It is time to let those juices flowing. 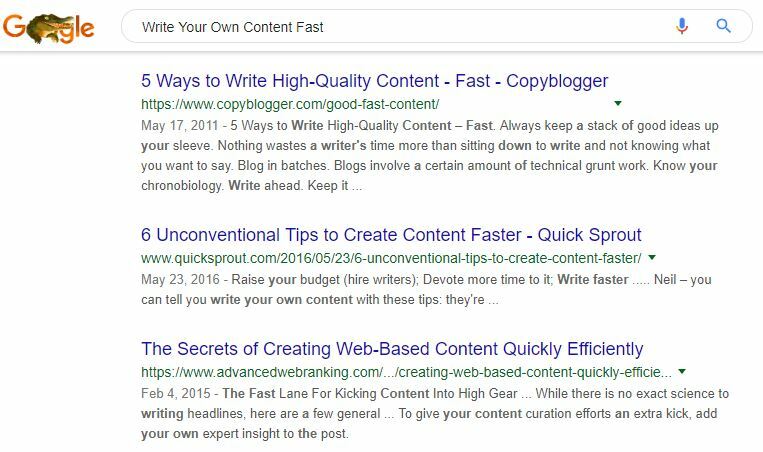 Now, as you can see from my example so far, I have used all those metrics to discover that the title of this post, ‘write your content fast,’ might be the winning formula for my article. By following the instructions that I have laid in front of you, I am sure that my post might get a few clicks somewhere on Google. You see, Google might not give you rankings for the exact term you are aiming at, but, it may offer your post for some similar queries. It is something that is entirely out of our reach, unfortunately, and as far as I know. However, we can influence the process by doing correctly everything I have show you so far. The next great thing before writing the actual piece is to create a catching headline that might attract more clicks in the future. 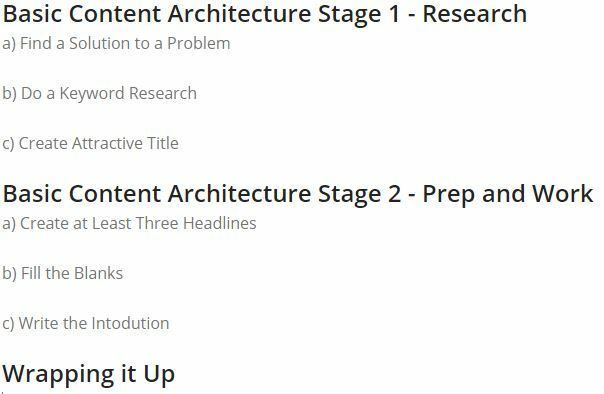 I have decided to enrich my chosen keyword by adding ‘basic content architecture’ in the title. It adds more authority to my words and makes it look professional. Later on, I try to do it the same way. In other words, I will always talk the talk and walk the walk. Here you can be creative as much as you can. You can even add some more keywords to open up your chances of getting ranked faster or also double up the keywords for which you are competing. By the end of the first stage, you should be ready to continue the flow and follow the next three instructions in the same spirit as so far. Now, I would like to show you how to architect a post the best way I know. This method works perfectly for me. I believe it will work for you as well. I have learned it from Kyle, the host, and co-founder of Wealthy Affiliate University. His method is brilliant! Let’s cut the small talk and resume with work. Once you have your topic, the keyword is ready also, and you have catching title, try to brainstorm three more headlines that will connect the problem you are trying to solve in one big picture. In other words, draw lines on paper before you put the bricks on the ground. Bellow is an example of how my post looked like after I finished with everything you have read so far. I even went a step further and created a fourth headline. You see, I like to write around 300 words under each headline because I was advised to do so by YOAST SEO plugin I was using before. It helps to get better readability score which is an essential aspect of Google’s eyes. When you architect your post like this, you will have a chance to calculate roughly how many words your future article will contain. The math is simple. Four headlines times 300 words equal 1200 words. To put it more poetic, now I know how many bricks I need for the first floor. I don’t stick to the number every time. If I feel I can share more, I will do it. That is why I like to create some H3 headlines to make numbers even. I will explain how under the next H3 headline. I have realized that I can say much more than 300 hundred words for each H2. Therefore I have decided to architect the second floor as well. Bellow is how it looks. You see, now I am aware that I can write much more because now, I know my topic in more detail. This short preparation gives you a full blueprint for your future blog post. A proper architecture helps you to remove any creative block you may have while writing. Moreover, when prepared like this, you will write as twice as fast. At the time of reaching this stage of the preparation, I am already eager to start with writing. I can feel the words coming out of my fingers! That is what waits for you too if you practice this method for at least one year. We are now ready to let the flow run free. The damp is up, and the words should be flowing naturally. As my last advice to you before I wrap it up, write a short introduction where you introduce your topic and yourself to your readers. In other words, share something small about yourself, say how you had the same trouble but now you know the solution. Moreover, add a lot of positive thought to the opening lines to catch the attention of the people who will read your post. The rest will follow up by itself. This part of the post is where I usually wrap things up with a lovely red ribbon. Some people call it conclusion, some say the end, and so on. So, to conclude shortly everything I have said so far. If you follow some or in the best case all of the ‘rules’ that I have given you in this post, I am more than sure that your writing skills will go up and away. However, it would be a shame if no one can see your fantastic new writing skills. I got you covered too! I have a good piece of content showing you how to get traffic to your website (CHAPTER 6.) for free. Once again, almost everything I have learned about writing online came from one source. That is Wealthy Affiliate University. Sometimes when I write, I like to take that extra mile or stay ten minutes longer than others just because it adds more value to my work (at least I hope it does). In other words, those who are willing to beat the craft over and over will ultimately achieve success. I have prepared for you three more golden advice that I have picked up while learning from the best people in the industry. Since I heard this advice, I was reborn. I told you at the beginning that I will explain why should you profile your imaginary friend before you start to write. You see, by doing this small mental exercise, you are creating someone to talk. When your content is out there, eventually and hopefully, you will attract that imaginary buddy to read your advice. You will be able to help him or her by sharing your experience with the same problem. The power of the pen, ha? Pressure is a negative state. While you are under stress, you are not able to perform. Why do you think that some of the world top athletes have winning streaks? And sometimes they can’t score no matter what? They are the same person as yesterday and day before, but they don’t seem to be the same. On the other hand, once you relax before taking action, your activity will be in the same spirit. It is simple and straightforward as it sounds. Sometimes, I feel the pressure of life, we all do. However, if I am aware I want to write something interesting, but the weight is holding me back, I meditate before. I will close my eyes for two or three minutes, sometimes even longer, to meditate. By the end of the session, I focus on nothing except me and my work. One time I was listening to a master of a particular skill while he was explaining the process. By the end of the lesson, he did something which has burned itself to my mind forever. A short yet so powerful lesson it was. All I have to do is snap my fingers to remember it! Alright, let me tell you what he did. The man was teaching a lesson about creating a habit and how habit, once formed, stays with you for the rest of your life. Later on, you are only upgrading it, but you cannot forget it ever! It is yours. As he was about to finish, he said ‘the key to learning in life hides in one word, REPETITION.’ Then, he started to snap his fingers while he was talking and I was hypnotized by the act immediately. He gave me a key to the process we call life in a few finger snaps. Another great advice I have got from a fellow blogger is to write naturally and then fix it later. You see, if you are careful about your mistakes all the time, you can’t focus on your thoughts about the topic. On the other hand, when you let it all out quickly, and then come back to it after an hour or maybe day after, you will have a chance to edit and proofread the text. Want to hire a personal editor and proofreader? Grammarly will hover over your writing 24/7. It will scream at you as soon as you make the slightest mistake! Well, not literally, but you will get my point if you try it. By the way, it is free for 7-days to try out. Also, if you can, try to read it out loud so that you can hear your words and correct awkward sentences and such. First, you make a foundation, then lay bricks. In the end, you will clean up, install the windows and doors, put in some furniture and polish the floors. That is why we use the word, architecture. I hope you will follow some of my advice and that my help will work. I will be happy if you leave some thoughts, critics or questions down below so I can hear what you have to say. Great information for writing content. getting a base, doing research, getting proper keywords, having a great headline and proper structure for your information is the key to having a post that will be found and read by those looking to find an answer to their question. Having the right tools to help you with these tasks is a great start, do you like to use the site content at Wealthy Affiliate to write your post, it does have a lot of tools that are free to use. Honestly, I use WordPress Editor to write my content. However, I am well aware of all features of SiteContent within Wealthy Affiliate. I used to write there. Actually, I wrote only a few posts before I decided to write in Editor. You have reminded me of another great feature of the training which I have to start using more. Thanks for leaving your comment. I appreciate your time. Hi Zayac, thank you for recognizing the value of my post. Writing high-quality and well-researched content is a key to success on Google. Everything could go in vain without good prep work. On the other hand, once researched and architected correctly you can expect some great things with your content in years to come if you stay consistent in publishing your material. Thank you for leaving your input. I appreciate your time. This is a great article and really helps to break down how to write awesome content. It can be so hard to keep writing great content so putting this template in place will certainly help to produce better quality every time. 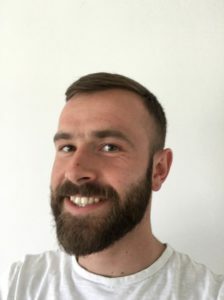 Yoast SEO is great isn’t it!! Hi Mike, a good prep is more than half of the work done. It has been true for years, and it will stay forever. Thanks for stopping by and leaving your comment. I appreciate it. About YOAST, it’s not a lousy plugin. I had a premium version for about six months and it taught me some good stuff. All in One SEO plugin, on the other hand, is shoulder to shoulder with YOAST in my mind. I have to try the premium version so I can speak more. For now, the difference is, as one book author wrote, thin as a razor’s edge. 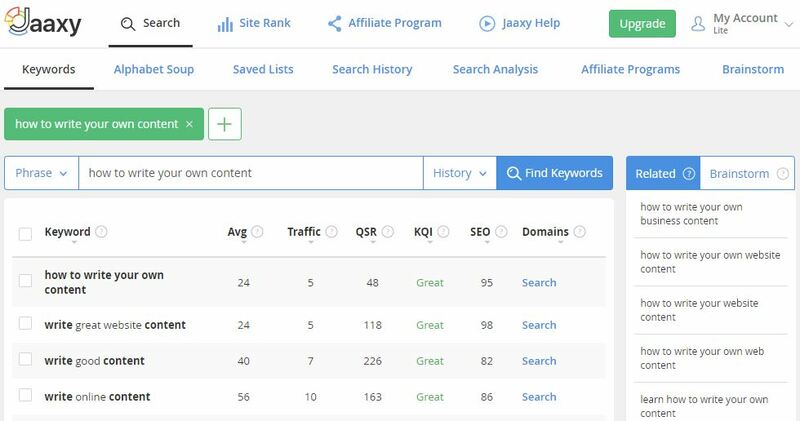 I find Jaaxy the most useful tool for keyword research! The fact that you can get a rough idea of the traffic a keyword will bring and the competition with that keyword is great. I remember going through the training on WA and learning the “100 method”, not sure if that’s the right name but that’s how I remember it (below 100 QSR, 40 or higher average monthly traffic). What I found interesting was when you mentioned about writing 300 words under each headline for better readability score, I usually do this without having to try but there may be some areas I fail to use it in, so thank you for making me aware of this! I also like the “write as if you were talking to a friend” tip because yes it does make the article more enjoyable to read! Great article! Keep up the good work! Hi Nick, that method was and still is one of the best things I’ve learned at Wealthy Affiliate. Discovery of Jaaxy, as well as full instruction on how to use the tools, was a complete game changer for me. There are many small things like writing 300 words under each headline that can improve your score with search engines. User experience is at the first place in this game. You should use every trick you can find. I’ve learnt several little tricks from browsing your site! I think you’re doing a fantastic job here. I’d recommend this site to anyone, there’s great content throughout. Keep up the good work man! Hi Nick, thanks for leaving your input. I appreciate it. I will continue to work even better, no worries. Keep coming back for more tips and tricks. Hi Glenford, thank you for your comment. I am happy to help you improve your writing skills. Hi Ivan and thanks for the great article. Having the proper architecture makes writing so much easier. Your breakdown works wonderfully. I also love your story telling which is another important part of writing content. As a member of Wealthy Affiliate, I can vouche for what they teach as well. The best place for a newbie to learn about online marketing. Wealthy Affiliate is undoubtedly the best place to learn content writing and a lot more interesting things related to content marketing.